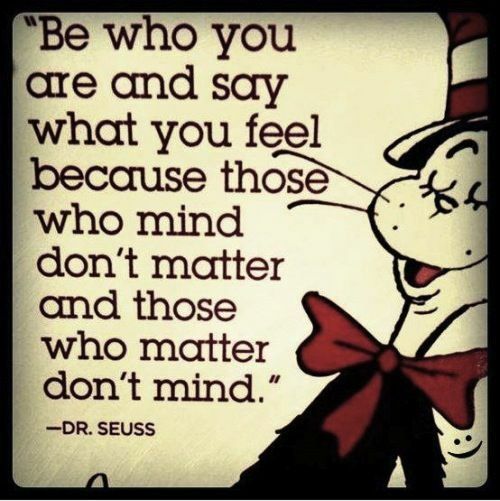 Categories: general | Tags: be yourself, blog post, Dr. Seuss, inspiration, inspirational, matter, mind, one-liner wednesday, quote | Permalink. Thank you to Linda for tagging me for this challenge. It’s a nice little nostalgia trip, going back and looking at my first post after a year here on WordPress. Copy-paste, link, pingback, etc. your first post. Identify the post: introduction, story, poem. Explain why it was your first post. Hi! This is my first blog post on this site, so please bear with me as I learn my way around WordPress. As you can see from my profile, I’m an animal/cat lover, a bit of a geek, and am an author. I have one book published so far and am working on a new book that I hope to have out soon. Visit my website for more info. So, this was a short and simple little introduction post, obviously. I wasn’t really sure what to do, as I wasn’t all that familiar with blogging. I had a general idea about it, but didn’t really have much experience with it. And at the time, I was just trying to build up an online presence as an indie author, and have a blog to go along with my social media presence. So I decided to start with just a short and sweet intro post. After a year, the main reason for the blog hasn’t really changed, but I’ve learned more about blogging, and enjoy it and hope to do more with it in the future. Now, who to nominate? Whose first posts would I like to see? Hm. How about these 5, and anyone else who would like to take part. Categories: blog awards, books, general, writing | Tags: author, blog post, blogging, book, challenge, first post, indie, writing | Permalink. I would like to thank Shelia Renee Parker for nominating me for this and giving me these very interesting questions to answer. I shall do my best! I feel like I have that many already! How do I choose? I guess it pretty much depends on my mood. I decide what type of book I’m in the mood for (fantasy? mystery? suspense? animal? horror? YA? light and fun or heavy? etc.) and go from there as to whether I want something that’s been sitting for a while or something newer. Probably commit. I’ve already gone halfway, I might as well finish it out, and who knows, it might get better. I’ll keep going and see just how far I can go with it, for g.p. Doesn’t bother me. I enjoy books for the story, not the cover, and what I picture when I read doesn’t usually match the covers, either. Kinda like the in Dresden Files, where they insist on giving Harry a hat to wear on the covers, even though he doesn’t wear one in the books. I do admit, though, that the hat looks pretty good on him in the covers. I just let them be. I’m sure I probably like books they don’t, as well. But if I happen to find someone (like someone online, for instance) who shares my dislike of said book, so much the better. If it’s been a long time coming, I’ll re-read, otherwise, I’ll just start the sequel and usually I’ll be able to recall most of what had happened. I don’t usually keep people from borrowing a book. I just ask them to make sure they return it when they’re done. I don’t know that I’ve ever really had a reading slump. Granted, I’ve got about 5 books going right now, some I’m reading more on than others. But I will finish them. I just get in different moods to read different things. I buy one or two at a time, depending on which ones I want most at the time, and if it’s close to Christmas or my birthday, ask for the others as gifts. If I’m really eager to read it, I’ll start it that day or within a day or two, otherwise I usually wait at least until I’ve finished a book I’m currently reading. Categories: blog awards, books, general | Tags: answers, blog award, blog post, books, habits, interview, nominations, questions, reading | Permalink. Categories: general, humor | Tags: blog post, catch-22, experience, frustration, funny, humor, Jackie Chan, job search, meme, one-liner wednesday, quote, work | Permalink. Life is too short to worry about what others think or say about you. 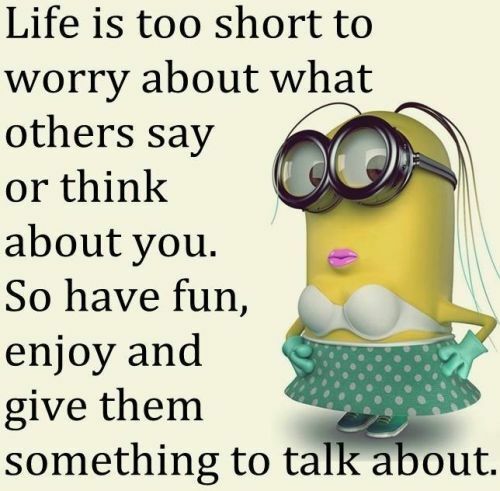 So have fun, enjoy and give them something to talk about. Categories: general, humor | Tags: blog post, don't worry, enjoy, funny, humor, inspirational, life, Minion, one-liner wednesday, quote | Permalink. Categories: books, general, humor, publishing, Uncategorized, writing | Tags: blog post, books, cartoon, comic, funny, humor, Peanuts, publishing, reblog, Snoopy, writing | Permalink. 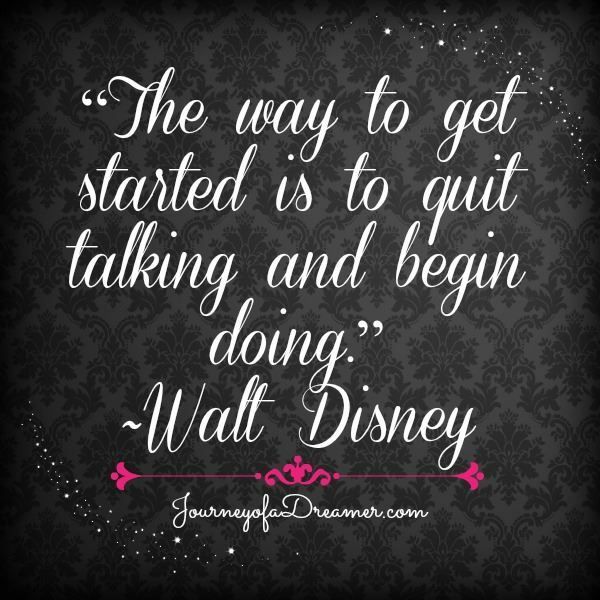 Categories: general | Tags: blog post, get started, inspirational, one-liner wednesday, quote, Walt Disney | Permalink.